Why must you be so far away and give me such good (and healthy) food. I had never, never, ever seen any Explore Asian noodle cups anywhere around here…but I find you while cruising the international food aisles on my birthday, and…not knowing any better…only pick up enough for me to have once (I got two, for the record, but my roomie ate the other one). This week, I’ve been really slacking on the meal prep for lunch. In fact…it’s been vegetarian sushi and soup all week, because, it’s affordable, easy, and healthy! At least I’m keeping it healthy, regardless of not really prepping anything to have on hand or keeping something on hand (okay…technically the soup was kept on hand…but I digress…), which is more than a lot of people manage. Monday, due to being out of town…vegetarian sushi. Tuesday…Amy’s Thai Coconut Soup (from a can…but SO GOOD! ), Wednesday…SOFT PRETZEL WEDNESDAY at ANNIE MAY’S SWEET CAFE in Louisville. Best (and only) gluten-free soft pretzels I’ve had out of an allergen-free bakery! 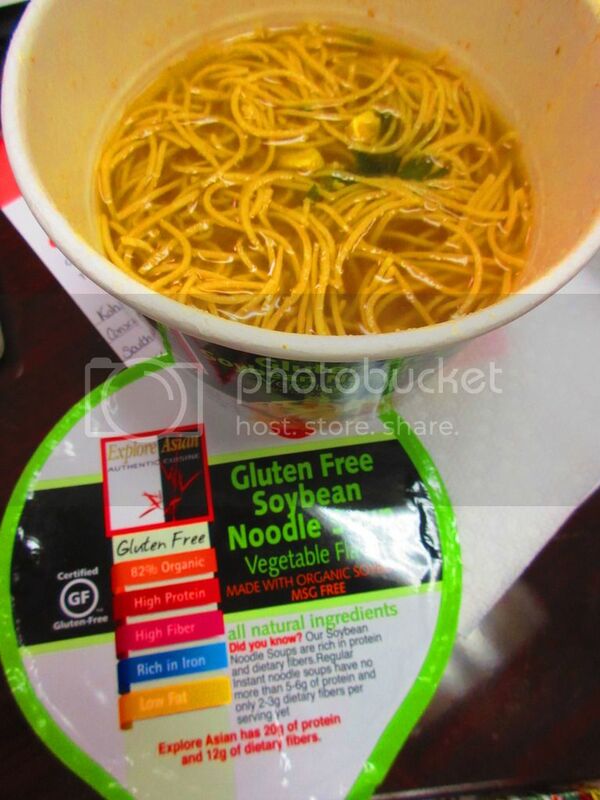 Thursday…soup…and this time…like a Cup ‘O Noodle…I pulled out the very new to my pantry Explore Asian Gluten Free Vegetable Flavor Soybean Noodle Soup. Because it was easy and I didn’t have to really do anything the night before to prep it. How’s that for me being lazy. Hey, I’m coming off a crazy, hectic, fun wedding weekend…I haven’t recovered yet! Explore Asian strives to be innovative creators of everyday family friendly foods with a healthier twist. While a small company, they still strive to put a lot of effort into exploring the world to find the highest quality, organic, and natural foods for their consumers to enjoy. In fact, Explore Asian works directly with farmers to provide top of the line products. Not only that, they take time to build a superior product that not only tastes good, but will nourish the body. And, they believe in transparency when it comes to their consumers, maintaining a policy of being open and honest. So, here we have a product similar to a Cup ‘O Noodle that is claiming to be healthy. And you know what? It really is! In fact, people who consume Explore Asian products include healthy living advocates, athletes, people with special diets (gluten-free, wheat-free, egg-free), people who follow heart healthy diets (20 GI index for Explore Asian bean pastas), dieters and people trying to lose weight, non-GMO advocates, chefs and restaurants, vegans, and people who have to eat kosher! Yep…all of that. Anyway, I returned as my bowl was finishing up and I removed it from the microwave and walked it (with fork in hand) back to my desk. I let it cool slightly before dipping the fork into the broth and spinning up a clump of the soybean noodles. One taste was all it took for me to immediately berate myself for not purchasing more of these beauties. The noodles were perfect…not mushy and definitely not going to get mushy throughout the time it took me to consume said container. They stayed perfect…al dente and delicious! I mean…really delicious. The seasoning packet added all the flavor, and the brilliant part of the salt packet was that I could choose how much salt went in. I put in half the packet in each bowl…and it was perfect. Great flavor. The noodles were definitely the stars. My only complaint, I think, was that there were only like 4 pieces of vegetable in this soup. It was all broth and noodle…and a piece of corn…maybe two…and a little bit of the chives. I can’t make this up. So, a little lacking on the actual vegetables…but those noodles were on point. YUMMY! And, trust me, nothing makes a hectic week better like a warm bowl of soup. Am I right? Of course I’m right! So, let’s discuss the ingredients that are inside the Explore Asian Gluten Free Vegetable Flavor Soybean Noodle Soup, shall we? This soup contains organic soybeans, organic rice, water. The seasoning packet includes maltodextrin, sichuanese pepper, wild pepper, star anise, garlic, ginger, cinnamon, dehydrated chives, dehydrated carrot, dehydrated sweet corn. And, as mentioned, the salt packet is separate. This amazing soup is gluten free, vegan (they also have vegan chicken and beef flavored as well), and non-GMO. So, I’ve mentioned how this is actually a healthy (and filling) choice for an easy, brain-less meal, right? But now let me prove it with the nutritional information on the Explore Asian Gluten Free Vegetable Flavor Soybean Noodle Soup. A serving size is 2.2 ounces (aka: 1 container). This serving will dish up 207 calories, 3 grams fat, 0.5 grams saturated fat, 0 grams trans fat, 0 grams cholesterol, 150 mg sodium (if you add the entire salt packet, you are adding an additional 606 mg sodium…so if you are watching your sodium intake like we are…a dash does just fine! ), 25 grams carbohydrates, 12 grams fiber, 8 grams sugars, and 20 grams of protein. When I said that this soup will make you feel full, I wasn’t kidding!! Filling, yes…but even more importantly…YUMMY! This soup went above and beyond all expectations. This is not ramen noodles. This is not Cup ‘O Noodle. This is a healthy, beneficial, amazing soup that I hope I can locate somewhere around where I live…otherwise next time I journey through Cincinnati…I’ll have to stop off at Jungle Jim’s specifically to pick up more of these. It was a lunch I felt good about eating…even if I was doing it at my desk while working. This entry was posted in Asian, Beans, Clean Eating, Entree, Food, Gluten-Free, Pasta, Products, Review, Soup, Vegan, Vegetables, Vegetarian by The Celiathlete. Bookmark the permalink.